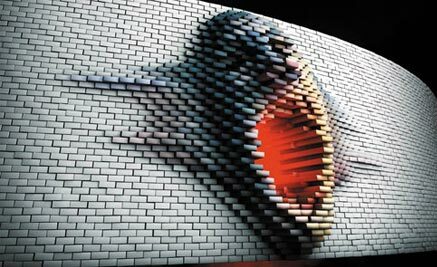 Pink Floyd’s The Wall is one of the most iconic and influential albums in the history of Rock & Roll. It was written by a very tormented Roger Waters back in 1979 as a a semi autobiographical piece that talks about the loss of his father, failed relationships and dealing with fame, addiction, pain and isolation. However this very intimate story has changed its meaning as The Wall becomes a metaphor of human separation; rich from poor, east from west, capitalism from communism, war from peace, etc. Last Saturday, July 23 of 2012, I had the privilege of watching The Wall live in Toronto and it was impressive to realize that this show is as relevant today as it ever was. Maybe that’s the reason why Roger Waters is dedicating 2 years to tour the world giving 192 performances of one of the most ambitious and sophisticated shows ever imagined. The stage features a 120 ft. physical wall that is being built before the audience’s eyes while the band is playing. The wall becomes a canvas to an overflow of graphics that synchronize with the music resulting in overwhelming emotion. There is a very strong anti-war, anti-capitalism message that is ubiquitous during the show, one of the highlights happening during the song “Goodbye Blue Sky” while an animation of B52’s drops Shell logos and Dollar signs instead of bombs. The song “Mother” becomes a criticism to the government where the main character is a security camera, always watching and “protecting” us. If you haven’t had the chance to watch the show yet, I would strongly encourage you to check out the finale of the tour on July 21 in Quebec City which will include a bigger-than-ever wall of over 250 metres.